Solstice is an alternative investment and wealth advisor database focused on providing investors with powerful, innovative tools for building investment strategies and for managers to create visibility for their strategy. Solstice is the alternative database for RJO OASIS along with a number of other FCMs and Brokerage firms. 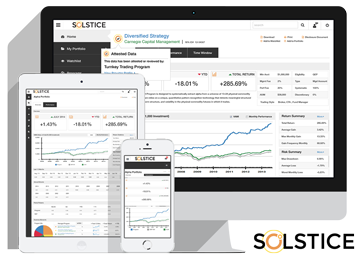 Solstice is available as a white-label database and soon as a stand-alone database for CTA managed futures research. Learn more about the Solstice CTA Database.